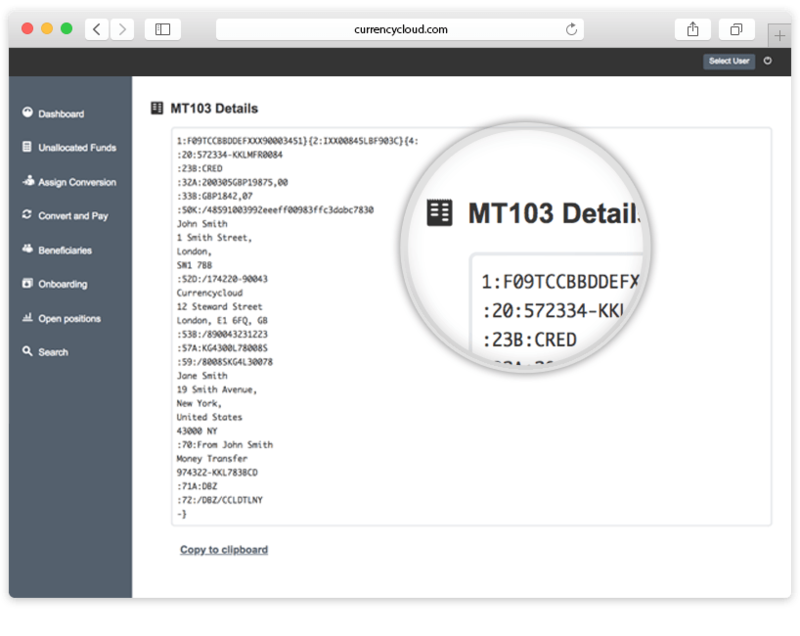 This short document describes how MT103 information of a payment can be retrieved from our payment platform. MT103 information is available only for payments that are sent through the SWIFT network, i.e. priority payments. This information can be accessed both through Currencycloud Direct UI or through the API. After finding a payment on the Currencycloud Direct UI, the details of the payment can be presented by clicking on the payment entry shown on the screen. If there is MT103 information available for the selected payment, this will be shown on the bottom of the payment details per the screenshot below. In order to retrieve MT103 information through the API, the following API call needs to be used get /v2/payments/:id/submission_information where :id is the payment ID. If MT103 information for the payment exists, this will be returned as an API response. An example of such a response is shown below.